Sitting in the shade on a bright, warm July afternoon, I think, who wouldn't love this charming place? "We came, at dusk, within sight of the Lake of Bolsena, on whose bank there is a little town of the same name, much celebrated for malaria. With the exception of this poor place, there is not a cottage on the banks of the lake, or near it (for nobody dare sleep there); not a boat upon its waters; not a stick or stake to break the dismal monotony of seven-and-twenty watery miles. We were late in getting in, the roads being very bad from heavy rains; and, after dark, the dullness of the scene was quite intolerable." Not a good first impression from Charles Dickens in his book, Pictures of Italy, describing of the first time he came to Bolsena, in Central Italy, in January 1845. 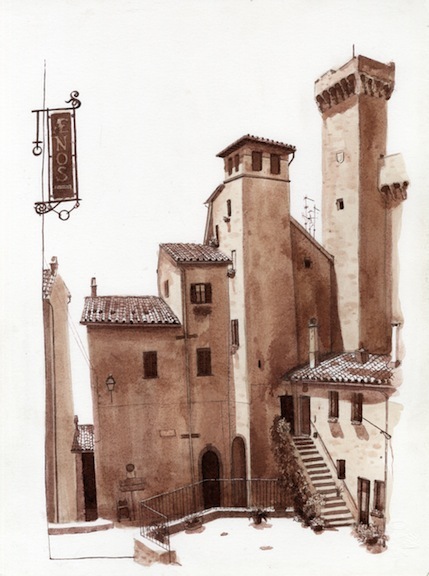 "Thirteen hours posting brings us to Bolsena (I slept there once before), on the margin of a stagnant lake whence the workpeople fly when the sun goes down - where it is a risk to go; where from a distance we saw a mist hang on the place; where in an inconcievable retched inn, no window can be opened; where our dinner was a pale ghost of a fish with an oily omelette, and we slept in great mouldering rooms tainted with ruined arches and heaps of dung- and coming from which we saw no colour in the cheek of man, woman, or child for another twenty miles." Found in The Life of Charles Dickens by Charles Foster, Dickens describes what he sees as a plague-ridden town. Today, Bolsena is beautiful. It's a small, friendly, tourist town overlooking a sparkling, boat-filled lake. The town was the setting of the Miracle of Saint Christina, and under the church celebrating that event, lie a fascinating warren of catacombs. It is certainly worth a visit. If the 1800's were the worst of times for Bolsena, then these are the best of times.